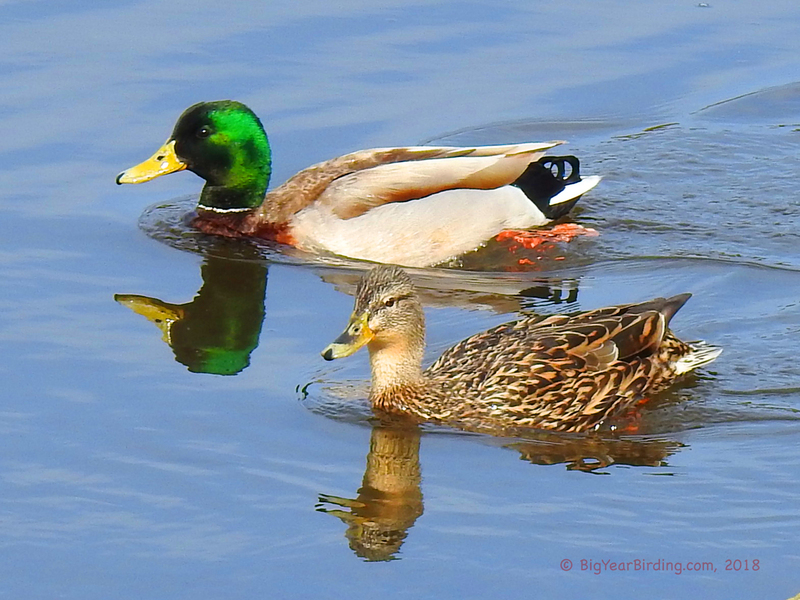 Perhaps the most familiar duck in the Northwest, the Mallard is a large and heavy bird. Males have gray bodies with chestnut-brown breasts, white collars, iridescent-green heads, and yellow bills. Females are mottled brown-and-black with lighter brown heads and necks and yellow bills mottled with black. They have a black stripe running horizontally through the eye. Both sexes have orange feet and a blue speculum, or wing-patch, bordered in white on two sides, best seen in flight. From June to September, immatures and males, which are then in non-breeding (eclipse) plumage, look much like females.